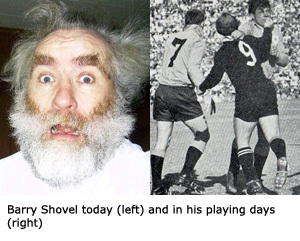 NEWSDESK: Barry Shovel, a half back capped six times for the All Blacks between 1967 and 1978 is not short of an opinion. Ask him about any issue of the day and he’ll give you both barrels and six sprigs down your back. Which is why journalists have been beating a path to his Te Waibotherau sheep farm gate, or the bowls club if it’s after half eleven. Recently, Shovel has branched out into broader social commentary, telling NewsTalk ZB’s Larry Williams “Next thing you know, they’ll make it illegal to drink and drive,” in a piece about the left hand turn rule review.